"You have to practice the values of independence and honesty." 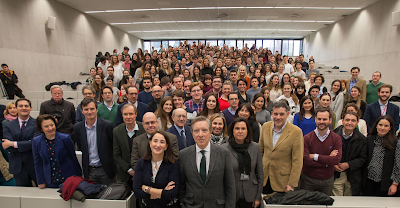 University of Navarra photo. An icon of Spanish broadcast journalism, Iñaki Gabilondo, delivered a message last week designed to inspire and challenge 400 students and professors of journalism. "The future hasn't been written yet:, he told them. "The question, 'What is going to happen?' is irrelevant. What will happen will be determined by what you do, what you don't do, and what you allow to happen." 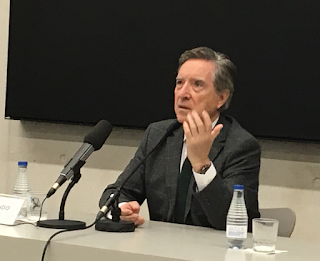 Gabilondo, 73, was speaking at his alma mater, the School of Communication of the University of Navarra (class of 1963), where he also was a professor for several years. His eloquent baritone voice is well known to Spaniards after decades of presence on the morning radio news program Hoy por Hoy, roughly equivalent to NPR's Morning Edition. 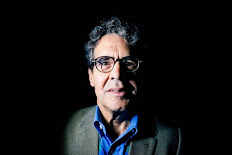 He recently asked Martin Baron, executive editor of the Washington Post, how journalism can survive amid all the problems we face, including the collapse of the economic model, the loss of credibility with the public, and the misinformation, disinformation, and junk published everywhere. The key, Baron replied, lies in practicing the values at the heart of the profession: editorial independence, credibility, honesty, and commitment to quality. "These are not just romantic ideas," Gabilondo said. "They are the essential elements of journalism. With these values you can move ahead. They are going to last." These days Gabilondo does a brief commentary on the news via a video blog carried on the website of El País, the country's leading daily newspaper. But he recently did a series of video interviews titled "When I'm not around: The world in 25 years", with leading scientists and technologists around the world. So Gabilondo is more interested in looking forward than in looking back. All of the rapid changes we are living with has caused some to call our time "the era of stupor", he said. "We don't know where anything is headed. We don't even know what to teach our kids. It's a very difficult time to understand because we can't view it with perspective." There have been many such moments in history when people thought we had arrived at the end of the world, he pointed out. But here we are. In this context, "It isn't possible to live with guarantees. Some in society have this infantile attitude that there should be guarantees. The word 'guarantee' doesn't exist. Neither does the word 'easy'. The mortal sin of our time -'Learning English is easy'- is a big lie." But unlike many journalism veterans--he has been at it for 50 years--he is not pessimistic. "What is dying is A world, not THE world. While one world is dying, another is being born. But the trees that are falling make much more noise than the trees that are growing." In this time of uncertainty and misinformation, we need journalism more than ever, he said. We need journalists who can sift through all the noise, find sources of reliable information, verify it, and make sense of it. "Ethics and trust are essential for journalists," he told the students. "You have chosen the most wonderful profession in the world." On a personal note: Some 20 years ago when I was teaching myself Spanish (previously I had studied French and Italian), I subscribed to a language-learning service called Puerta del Sol, which had news stories taken from Iñaki Gabilondo's radio program on an audiocassette, along with a transcription of the text in Spanish. For several years, I listened to these tapes in my car on my daily commute. Gabilondo's authoritative, eloquent baritone voice is still in my head. I feel as though I know him personally. Radio--today it's podcasts--does that. More photos from his visit to the University of Navarra.